those who follow the story of the blimps know that the grid is a very dangerous place. some parcels are full. some parcels have scripts turned off. some parcels have owners who viciously murder the blimps. each of these perils (and others) kill the blimps in their tracks. 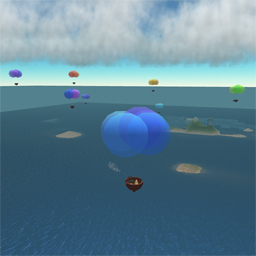 to compensate, the blimps reproduce themselves when their numbers get low. but it remains a problem. i’ve spent the last three months (off and on) hand tweaking the blimps to try to avoid these dangers. well i just realized i’ve been being silly. there is a much better way. natural selection. evolution. artificial life. blimps who (by chance) wander into dangerous areas will die, and their genes will disappear from the gene pool. blimps who (by chance) avoid danger will reproduce more often, and their genes will dominate the gene pool. the blimps will “learn” to avoid danger. they evolve. by some definitions, they are alive. there is of course much more work to do. sexual reproduction is important. many more genes for coding behavoir. perhaps genes to form a brain (neural net? symbolic engine?) that uses sensors and listens to affect its movement. genetic algorithm tricks i’ve been dying to try. and more and more. for the curious – check out the course notes from a genetic algorithms class i once taught. as always, you may catch a ride on the blimps by stopping at the blimpco blimp bay. If blimps learn of dangerous parcels by dying, how will that be communicated and memorized by the survivors? (If you don’t use communication, just reproduction…) If you are making a map out of a data structure recording a blimp’s travels, how will you differentiate between “that spot is dangerous” and “I just never flew over that spot”? In other words, how will you avoid a paralyzing fear of the unknown? Random partial forgetfulness? At birth (good time to roll the dice)? During life? Or perhaps have Curiosity: Have a period of time when either the map doesn’t matter, or the blimp actively chooses to go to _n_ randomly selected unknown locations? Have a gene for _n_, which of course will vary? well – it works the same way as real life. if there are two kinds of mice, one that fear cats and one that don’t, you can imagine that over time mice “learn” to fear cats, even without communication. currently – the path is completely defined by the genome. in place of your “curiosity”, the genes randomly mutate during the reproduction phase – so places which have been scary in the past will eventually be re-explored.